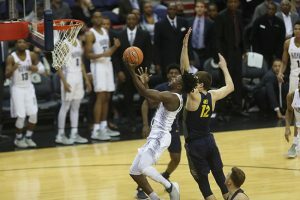 If the Hoyas have done anything that people will remember from this season, it would be they have done a great job in taking teams to overtime, tonight it was Marquette that allowed the Hoyas one more chance to get their second one in extras. Andrew Rowsey’s name was called plenty of times in regulation and it was called one too many times in overtime. He led the way for the Golden Eagles with nine overtime points. Georgetown, as a whole, had eight points in the extra period. Rowsey’s entire night was particularly impressive, as the senior guard tied teammate Sam Hauser with 28 points. Rowsey also dished out a game-high 10 assists. Where Rowsey hit four threes, but got his points from the other parts of the court, Hauser just set up from beyond the arc. He hit seven of eight shots from long range, tying a career-high. Markus Howard made his presence felt, as well. Howard had 16 points and four threes of his own as the sophomore guard continues to battle back from a hip injury. Both teams traded the lead 10 times throughout the 45 minute contest. Georgetown took a 46-40 lead into the half before trading back and forth throughout the period. With three seconds to play and Marquette winning by two, Jonathan Mulmore took it the length of the court to tie the game. “We were happy with some of the things that happened in the overtime, we just did not have enough answers for their outside shooting in overtime,” said Hoyas Head Coach Patrick Ewing. The Hoyas have one more regular season game on Saturday against Villanova to close out the regular season before heading to the Big East Tournament in NYC, which will most likely see them playing their first game on Wednesday.